School personnel had recommended the children for participation in the Child Clothing Project, the chief initiative of the Junior League of the Emerald Coast. With a hundred dollars, each child would purchase two pairs of pants, two shirts, a coat, a pair of shoes, socks, underwear, hygiene products and a book. Financial supporters of the project include Emerald Coast magazine, which contributes proceeds from its annual Best of the Emerald Coast event to the cause. On Jan. 28, the magazine presented the Junior League with a check for $63,667.38. Fuentes said the Child Clothing Project has grown steadily and this year helped out children who had been displaced from their homes by Hurricane Michael in addition to assisting established Okaloosa and Walton County residents. Further, Fuentes noted that the League has stocked clothing lockers at six schools so that needs for clothing can be addressed throughout the year. For the past eight years, the Grand Boulevard shopping and dining district has hosted the Best of the Emerald Coast event at which winners in Emerald Coast magazine’s annual reader’s poll man booths, tell their stories and display products and services. 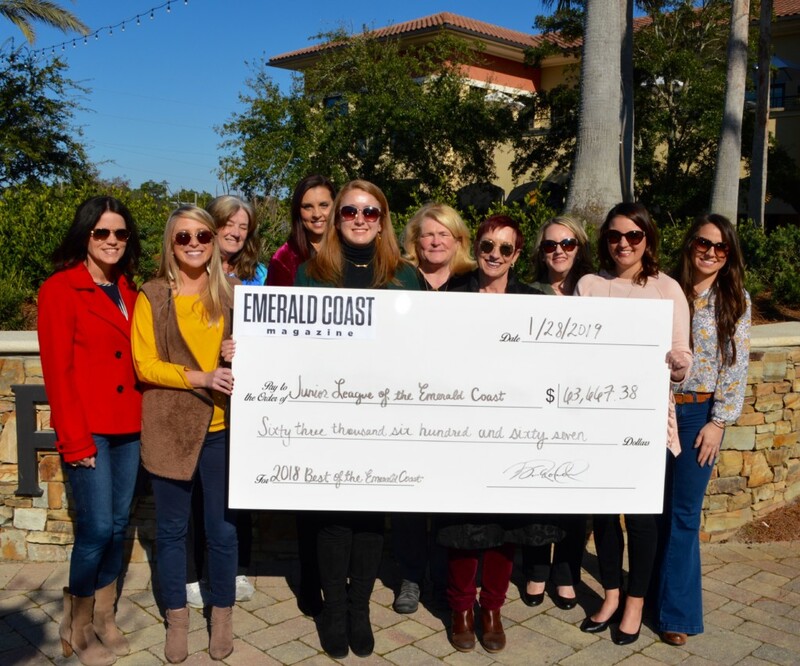 “We have had a productive, long-term relationship with the League and we love the Best of the Emerald Coast event,” said Stacey Brady, Grand Boulevard’s marketing and communication director. “It’s like a big street party where people can learn about our area’s best businesses, and it attracts a big crowd. Mac Little, the sales and events coordinator for Rowland Publishing, which publishes Emerald Coast magazine, echoed Brady’s remarks.